An intimate venue in Linden plays host to two world-renowned “miracles of profound sound” next week. 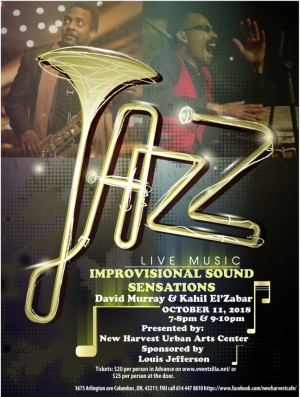 In a pairing entitled Improvisational Sound Sensations, David Murray and Kahil El’Zabar will perform two shows at New Harvest Cafe & Urban Arts Center, 1675 Arlington Avenue in Linden, on Thursday, October 11th from 7-8pm and 9-10pm. Tickets for both performances are available here. Percussionist and multi-instrumentalist El’Zabar joined the Association for the Advancement of Creative Musicians (AACM) in the early 1970s, becoming its chairman in 1975, and the musical groups Ritual Trio and the Ethnic Heritage Ensemble that he formed in the 1970s remain active today. Tenor saxophonist and bass clarinetist Murray was a founding member of the World Saxophone Quartet with Oliver Lake, Julius Hemphill and Hamiet Bluiett, and has appeared on hundreds of recordings as a leader and musician. Get your tickets now for a meeting of two of the world’s legendary improvisational minds! Keep reading for further biographical details and videos of the artists. Kahil El’Zabar is revered globally as a cultural visionary and an innovative music conceptualist. He has recorded more than 60 acclaimed projects as the leader, Composer, and arranger. El’ Zabar, who holds a PHD in Inter/Disciplinary Arts from Lake Forest College, has worked with such luminaries as Dizzy Gillespie, Pharoah Sanders, Nina Simone, Stevie Wonder, Cannonball Adderley, Archie Shepp, Paul Simon, Lester Bowie, Nona Hendryx, Kurt Elling, Billy Bang, Eddie Harris, Neneh Cherry, Henry Threadgill, Roy Ayers, and David Murray. Learn more here. David Murray is one of the most recorded musicians as a leader in the history of jazz, with well over 200 celebrated projects. Murray was one of the founding members of the World Saxophone Quartet and has worked with greats like Elvin Jones, Jack DeJohnette, McCoy Tyner, Lester Bowie, Hamiet Bluiett, Jerry Garcia, Max Roach, Amiri Baraka, Randy Weston, Macy Gray and Fred Hopkins. He is currently working with Saul Williams as part of his David Murray Infinity Quartet. In 2012, David Murray received an Honorary Doctorate of Music Degree from Pomona College, Claremont, California. He has won numerous awards over his vast career garnering a Grammy Award for the Best Jazz Instrumental Group Performance, for his Tribute to John Coltrane and a Guggenheim Fellowship. Learn more more here.